As one of the most elite schools in the country, Fuqua has the facilities to match. Our half-million square feet have been consciously designed using wide spaces and natural lighting to create an environment that aligns with our culture. Abundant views of Duke Forest bring the natural world inside, while our terraces, patios, and shaded benches provide ample opportunity to enjoy the fresh Carolina sunshine. 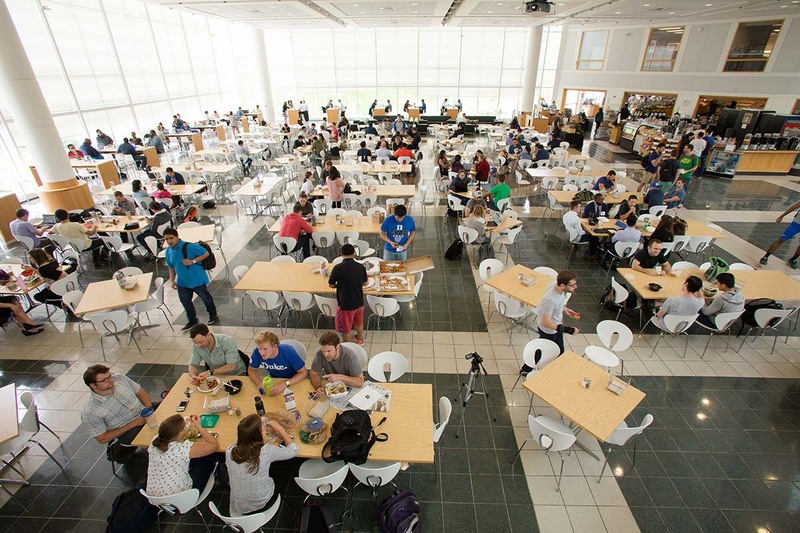 We’re about people intersecting and collaborating, so on campus you’ll find spaces for teams, class, recruiting, socializing, research, and meetings have been deliberately comingled. Our buildings facilitate organic interactions between faculty, students, visitors, and staff. 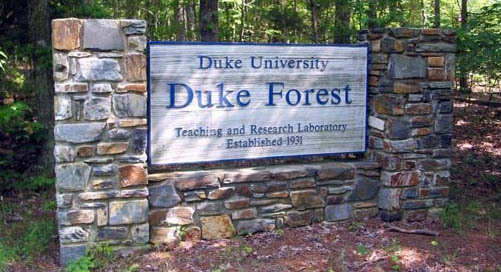 Duke Forest is home to 12 natural heritage sites on 1,200 acres. Fuqua has a long-standing commitment to environmental stewardship, and the campus reflects our focus on sustainability. Our students, faculty, and staff all contribute to lowering our school’s carbon footprint by using efficient transportation options and supporting waste reduction by participating in single-stream recycling, composting, and the use of reusable utensils and food containers. Energy-efficient lighting and HVAC, as well as water-saving devices, are in place throughout Fuqua’s facilities. The sustainable construction and design of our new JB Duke Hotel and renovated Thomas Executive Conference Center included all-new infrastructure to improve energy and water efficiency and indoor environmental quality and landscaping to reduce runoff. 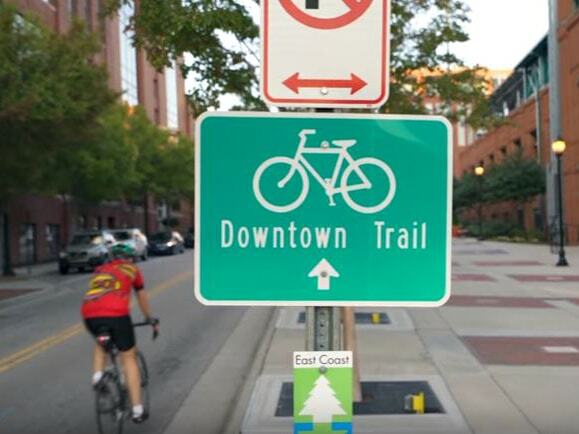 We integrate technology in ways that champion collaboration. High-performance encrypted wireless access runs throughout the campus, while kiosk stations provide fast access to e-mail and information. Motion sensors show real-time team room availability, with an online app to reserve space and manage logistics for meetings. Team spaces have wireless shared displays for project work, while an open incubator collaboration space facilitates larger groups around multiple flat panel displays. A proprietary intranet provides personalized access to course-related material, school events and announcements, career services information, and community directories. A student life collaboration platform provides a one-stop shop for our students to manage all their club-related activities, including events, websites, newsletters, blogs, and external communications. Specialists in our Technical Support Center support the community’s IT needs via walk-in, appointment, telephone, e-mail, and TSC Online access via both video and text tutorials. Our chefs work with fresh local ingredients and purchase sustainable products to create authentic global and local cuisine. We support our partner farms and use sustainable practices in our food service operation, while creating from-scratch, healthy, balanced foods. Check out today’s menus. 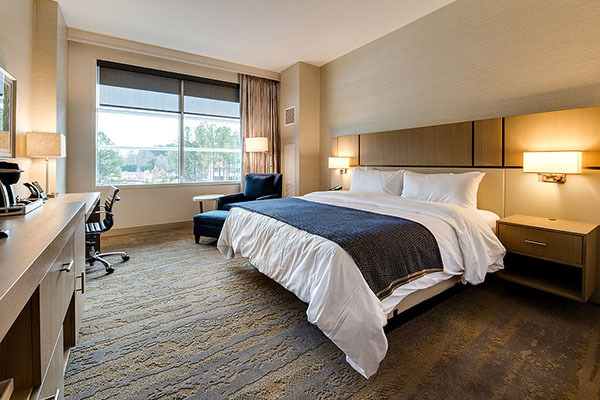 Located directly next to Fuqua, this renovated hotel encompasses the Thomas Executive Conference Center, 198 guest rooms and suites, a restaurant, two bars, and a fitness center. The hotel offers outdoor amenities such as courtyards and a patio with fire tables, a bocce court, and a bamboo serenity garden. The JB Duke Hotel has earned a four-diamond rating from AAA and is LEED Silver certified. Make a reservation.